TRIVIA of Noh : Q59 :What is meant by iroiri when discussing Noh costumes? | Home | Trivia | Q59 : What is meant by iroiri when discussing Noh costumes? What is meant by iroiri when discussing Noh costumes? Have you ever heard the terms iroiri or ironashi when discussing Noh costumes? 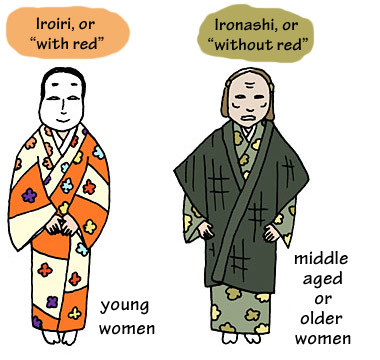 Iroiri, which means either, “with colour” or “with red” depending on the characters in which it is written, describes the costumes used for the roles of young women, which include shades of red. Ironashi, “without colour,” or “without red,” refer to the costumes for the roles of women middle aged or older. Of course they are not colourless, making use of greens, blues and purples, but do not include red, which is used especially to indicate feminine youth. The colour of the collar of the costume is also significant, with white indicating higher status, used for the shite. The costumes of Noh are most beautiful when seen on stage. While the costumes from the Azuchi-Momoyama period hold high cultural value, they are still used on stage today. They naturally see deterioration and damage from being used in performances, and while they can not be dry cleaned like kimonos, they are carefully maintained through precise hand restoration that is also passed down as a unique skill. Highly skilled weavers are also able to recreate antique costumes.